The London landscape for speciality coffee back in 2009 was pretty stark, except for a small handful of individuals who were starting to create waves in the local scene. We ourselves had only been roasting coffee for a year on Poyser St, so when the chance to work with someone as passionate and skillful as James Phillips came along, we jumped at the opportunity. Dose Espresso started life at 69 Long Lane in Smithfield, next door to where the cafe is currently situated. A small but perfectly formed shop, what immediately jumped out at you was their intense love of coffee and the red 3 group FB80 taking up pride of place on the counter. With enough space to sit 8 people with a few extras stood at the counter, it was a welcome addition to the changing landscape of Smithfield. I used to find any reason at all to drive past on my routes, stopping by almost daily for an aeropress followed by an espresso. Back then, the baristas used to hand grind each dose on a porlex, carefully balancing the aeropress on the counter while simultaneously grinding doses for espresso and steaming milk. Come to think of it, they probably had enough going on without me asking so many questions (I was just starting my journey into speciality coffee)! Fast forward to 2010 and the opportunity arose to take on a bigger shop right next door at number 70, which would offer more seating and a better flow for customers and staff alike. As you approach the front door, your line of sight is immediately guided through the cafe by the red streak of the counter, ceiling and customised Synesso Hydra. Pastries are supplied by Seven Seeded with baked goods brought in from Galeta, and if you are there for breakfast then make sure you don’t miss out on their bacon, avocado and halloumi ciabatta with extra chipotle tabasco – it is amazing! With coffee being such a big focus since the beginning, you have a wide array of coffee available to try. Red Brick is expertly prepared for all espresso and milk based drinks, with the guest grinder offering Sweetshop or a rotating single origin espresso. You can also choose from the daily batch brew, aeropress or clever dripper for something prepared by the cup, and in the summertime a never ending supply of cold brew is made in house on a toddy brewer along with iced americanos and lattes. If you are ever in the area and in need of some coffee for the home or office, Dose also has a large retail section with coffee from ourselves and a growing number of guest roasters. The knowledgeable baristas are more than happy to talk you through the joys of grinding and brewing coffee at home, and can offer advice on which brew method might suit the style of coffee you enjoy drinking. Dose Espresso was given the opportunity to expand in 2012, and their second site at Google Campus was born to help keep the tech startups of Silicon Roundabout caffeinated. Although this site is not generally open to the public, if you are looking to rent a desk in a shared workspace with great coffee and food then Dose Campus is the place. To still be relevant and at the top of the game in an ever growing market is testament to their own success. We are so proud to be working with James and his team and wish them all the best for another great year. 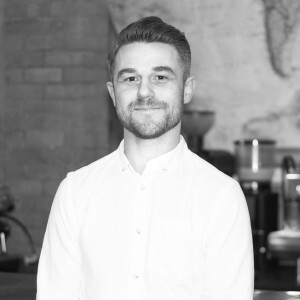 Peter Garcia is in charge of wholesale for Square Mile Coffee, and can often be found propping up the bar at one of our wholesale customer’s cafes around the UK.